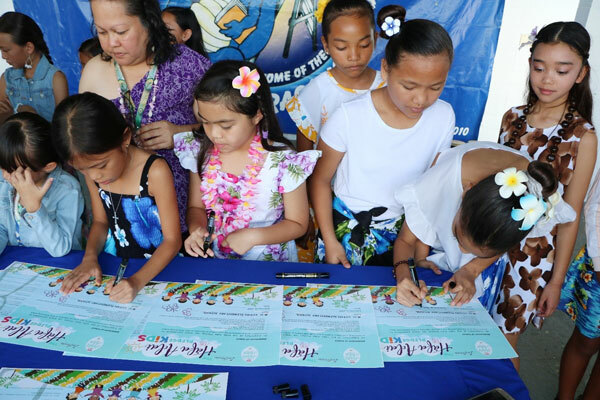 tudent representatives from M. U. Lujan Elementary School’s 5th Grade Student Council and grade levels took the Håfa Adai Pledge on February 11, 2019 on behalf of the entire student body, who were in attendance. (February 13, 2019 – Yoña, Guam) The Guam Visitors Bureau (GVB) had the pleasure of welcoming more than 500 students, 68 faculty and staff from M. U. Lujan Elem. School as members of the Håfa Adai Pledge Kids program on February 11, 2019 at the school’s campus in Yoña. Administrators, teachers, students and family members attended the Håfa Adai Pledge ceremony held during M.U. Lujan’s Student of the Month assembly, which also kicked off preparations for their Chamorro Month festivities. The students of M.U. Lujan Elem. School, home of the Dragons, made a roar as they opened the ceremony with several performances, which included cultural dances, chants, and songs led by Chamorro teachers Siñora Eva Cruz and Siñora Loretta Cruz. “The opening ceremony was an amazing display of the school’s dedication to incorporating their Håfa Adai Pledge initiatives into their everyday school culture,” said Dee Hernandez, GVB Cultural and Heritage Officer. GVB’s Public Information Officer Josh Tyquiengco led the student body in their pledge to protect Guam’s culture, share the Håfa Adai Spirit, and protect the island’s natural resources. Siñora LeVonne Mantanona led the students in signing their certificates. GVB thanks M.U. Lujan Elem. School for their determination and effort to perpetuate and promote Guam’s unique culture. GVB invites all local schools, clubs and students to take the pledge at the upcoming HAP Kids event taking place during GVB’s Ko’ko’ Kids Fest on March 24 from 7:00 a.m. to 2:00 p.m. at the Gov. Joseph Flores Memorial Park (Ypao Beach) in Tumon. Details can be found on GVB’s website, visitguam.com.